Los Angeles Valley College celebrated becoming the 200th All-Steinway School on Saturday, March 17, 2018. LAVC joins a prestigious list colleges, universities and conservatories who are known worldwide as “All-Steinway Schools”. The celebration kicked off with an LAVC Music Department Open House and Tour, which had Steinway and Boston (also made by Steinway) pianos on display in various classrooms and music labs. The celebration culminated in an evening concert by the Valley Symphony Orchestra featuring, of course, a new Steinway Grand piano. Joining the Valley Symphony Orchestra were the LAVC Wind Ensemble, the LAVC Chamber Singers and College Choir, and various soloists. 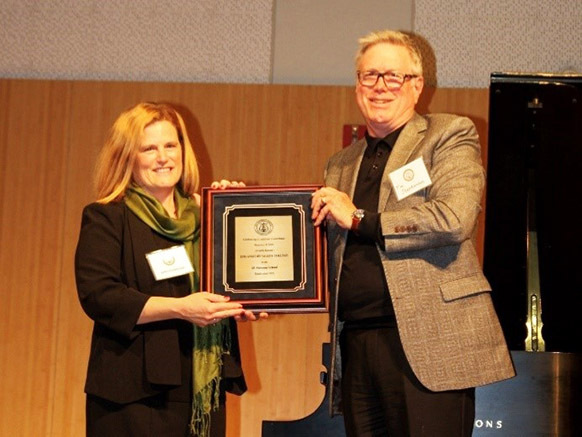 During the concert intermission, Steinway and Sons representative Tim Stephenson presented a plaque to LAVC President Dr. Erika Endrijonas recognizing LAVC as the 200th All-Steinway School, and the first in the San Fernando Valley. LAVC acquired eighteen of the twenty-two pianos from Steinway and Sons from the college’s equipment budget. The final four pianos were acquired with the assistance of the LAVC Foundation, which entered into a lease-to-own agreement with a Steinway finance company. The LAVC Foundation also hosted a special reception for some of its patrons prior to the concert to announce a forthcoming fundraising campaign. The goal of the LAVC Steinway Campaign is to raise about $340,000 to pay off early its lease, which acquired the Steinway pianos for the college. It will also raise an additional $1 million to establish an endowment for the pianos’ maintenance. To learn more about and to support the Steinway Piano Campaign, please go to Steinway Piano Campaign.